GOODNESS I love Royal & Derngate. I can’t help it. I’ve seen those theatres going through their ups and downs of the last twenty years and fight and win against the finance-sucking behemoth of the London arts scene. They’ve been consistently producing attractive and challenging theatre – with the brilliant Made in Northampton branding – while other regionals have struggled to survive. So when they announced the Festival of Chaos series of plays – The Bacchae (staged in the abandoned Chronicle & Echo press hall), Blood Wedding and Ibsen’s Hedda Gabler – it was further proof of their refusal to allow regional theatre to drop the curtain and bow out. Yes. Exciting, original theatre in our little Midlands town. World premieres, national arts press heading north to visit, international playwrights drafted in, unfailingly fabulous sets and live musicians; what’s not to like? I’ve been particularly looking forward to The Bacchae (which I can’t help but pronounce with a Scouse accent, as in; ‘aye, where’s me baccy?’), but couldn’t see it today on the afternoon press show. So first for us was Blood Wedding, a new adaptation of Federico Garcia Lorca’s tale of family feuds and infidelity set beneath the searing Andalucian sun. We’re introduced to The Groom (Liam Bergin) and his whining, mourning mother (Kathryn Pogson) as she constantly revisits the terrible deaths of her husband and son at the hands of the vicious Felix family. She’s seeing snakes in the kitchen and hidden all the knives. But the central setting is not the events of the past but the wedding of her surviving son to the daughter of a successful widower, brought up in isolation on one of Spain’s many desolately dry farms. (So far, so Shakespearean). While the wedding formalities are arranged we’re presented with the stifling poverty of Leonardo’s family. While his wife (played beautifully by the arresting Amanda Wilkin) and baby wait for him to get work and feed them physically and emotionally, he’s already detached himself and riding his horse into the dust to pursue illicit liaisons with the bride-to-be. As the marriage date arrives the (surprisingly large) cast gather to celebrate, but the Bride and Leonardo behave less like star-crossed lovers and more like spoilt teens. The Groom’s mother continues to dominate the play both physically and mentally as she perpetuates the mythology of her victimised family and drives the last good thing in her life away to seek revenge. As always the Royal’s staging is beautiful, innovative and makes the small stage work like a much bigger canvas. The cast work most effectively in the wedding scenes, when the swaying choreography and sweet vocals combine to give the audience its only sense of a hot Spanish setting. There’s also the surreal but effective performance of Robert Benfield (yes, a grown man) as The Girl, a dirty voice of reality who dips in and out of the action and whose purpose lends more to the playwright’s poetic obsession with death than the fluidity of the story. By the time The Cousin turned into The Moon I was truly confused and a little bit bored. The monologues dragged on, the occasional forays into ‘modern’ humour grated and broke the flow, and the search through the woods gave me no sense of jeopardy, perhaps because I already had no affection for the fugitives anyway. Seline Hizli as the Bride tried her damnedest to portray a woman who wanted to reject the path chosen for her as a woman, (while looking like a cross between Rose Byrne and Rachael Weiss). Similarly Amanda Wilkin gave the inexplicably rejected wife a life of sorrowful inevitability. Some of the movement was allegorical and beautiful. It was lovely to watch, but I wanted to feel the oppressive dry Spanish landscape of the 1930s. I wanted to care. Still, two rather buff male characters got their shirts off quite a lot, which was nice. 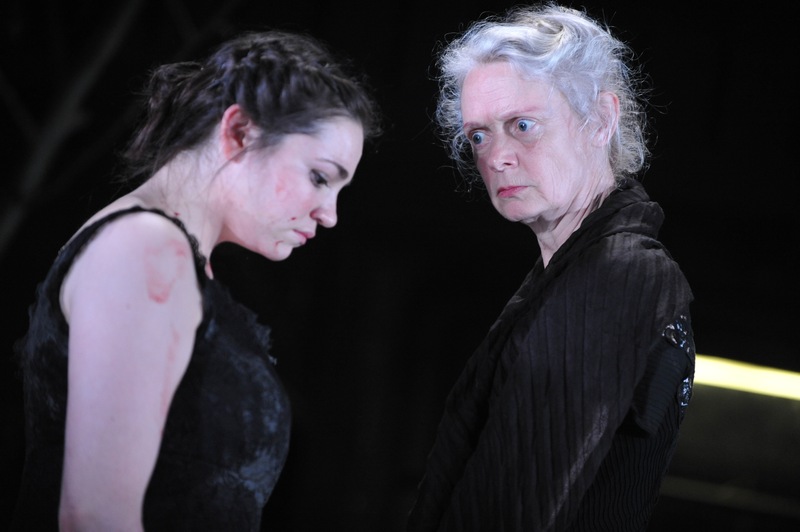 Blood Wedding runs at Royal & Derngate, Northampton until June 30. You can find out more about the whole Festival of Chaos line-up and book tickets on 01604 624811 or via http://www.royalandderngate.co.uk.